Welcome to Driftwood Estate! One of the most desired neighborhoods in the fastest growing area of North Santa Rosa Beach(Less than 5 miles to Scenic 30A). This beautifully maintained 4 bedrooms and 2 bathrooms with 2 cars garage are located in the heart of the of it all. Just a convenience short ride to many of the well know restaurants, supermarket, shopping and movie theatre (Grand Boulevard at Sandestin) and Sacred Heart Hospital. The very large (0.22acre) lot is perfectly located across a scenery pound and park with multiple views of neighborhood water feature. 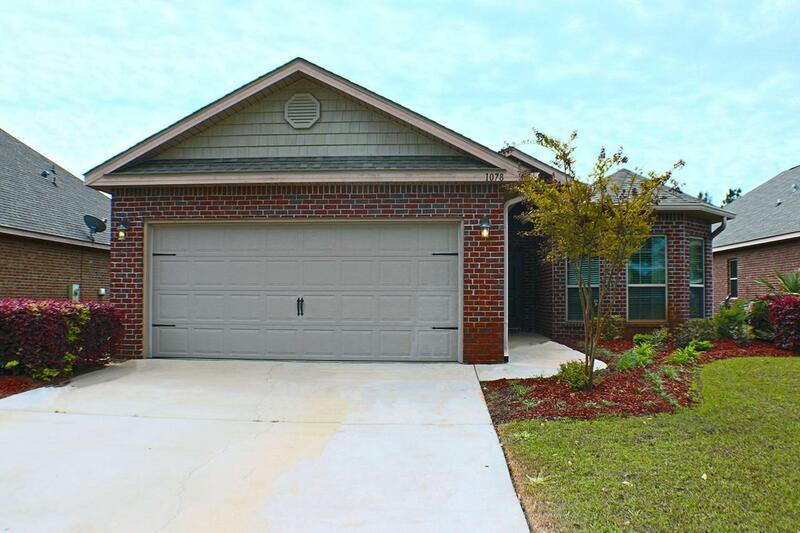 It is also just a short walk to a huge and well-maintained community pool and playground.This home provides a very carefully thought out floor plan starting with a very open living room to the dining room and kitchen and a lWelcome to Driftwood Estate! One of the most desired neighborhoods in the fastest growing area of North Santa Rosa Beach(Less than 5 miles to Scenic 30A). This beautifully maintained 4 bedrooms and 2 bathrooms with 2 cars garage are located in the heart of the of it all. Just a convenience short ride to many of the well know restaurants, supermarket, shopping and movie theatre (Grand Boulevard at Sandestin) and Sacred Heart Hospital. The very large (0.22acre) lot is perfectly located across a scenery pound and park with multiple views of neighborhood water feature. It is also just a short walk to a huge and well-maintained community pool and playground. This home provides a very carefully thought out floor plan starting with a very open living room to the dining room and kitchen and a lot of exposure of sunlight. Plenty of cabinets storage in the granite counter top kitchen. The home has tile flooring in the kitchen and hardwood floor throughout the common areas/ dining room and carpet in all the bedrooms. The master suite is located in the back of the home has a vaulted ceiling and bay windows. Separate large soak tub and shower in the master bathroom still with plenty of room for double vanities. A very large walk-in closet is also the key feature for this master suite. One of the 3 spacious bedrooms can easily be converted to an office or work out space. The laundry room with that can fit size washer and dryer also has additional closet space. Cover outdoor patio where the relaxation or entertain can take place is can become the ultimate focal point of the home. With a huge backyard, the possibility is endless. A great size pool or extended cover patio can be easily added. The privacy is not a concern because this home is existing has a fence in the backyard. Become an owner of this home to embrace the beautiful Florida Emerald Coast Lifestyle.